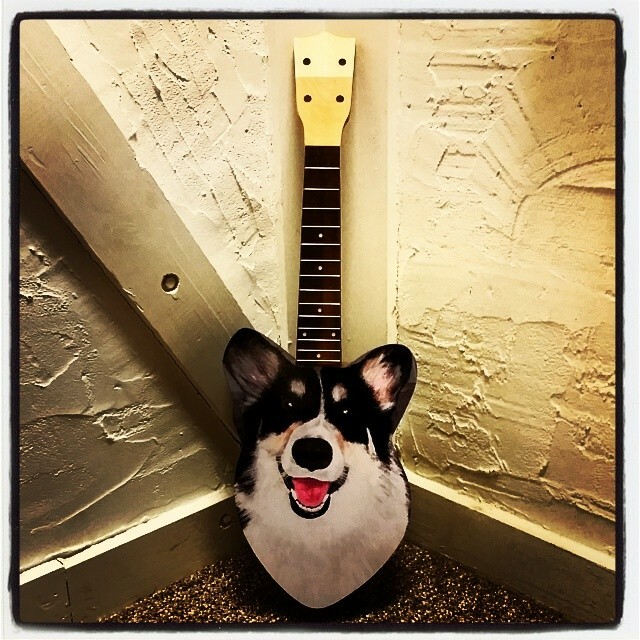 Like most out-there instrument builds, the corgi-uke halfway started as an idea but mostly as a joke, this particular lark played out on twitter. The problem was, I had already built close to 30 instruments in 2013 before September rolled around, and I was burned out. I kept telling myself that I would get around to it. I had just spent 6 weeks on a scooter unable to walk, I figured I’d be charged up to do it, but the truth is I was more charged up to do all the stuff I had been unable to do all summer long. Before I knew it, April had rolled around, but in a fit of productivity, I got the body cut and glued, and figured out in no small effort, how to attach the neck. With the neck attached to the body, I had to in a real way deal with how I was going to do the graphics. The photo I had made the body pattern from was really too low resolution. Talking through it the situation with the client, Jane Bozarth, she had shared with me that her stepmother had done a painting from the original cell phone photo. I quick hi res photograph of the painting and we were back in business. I had done vinyl adhesive graphics on an uke before, So I knew exactly where to go to get the graphics made up. The last thing to do was to decide where to put the soundhole. I had originally thought of putting the soundhole in the nose and ears in the black areas, but I was concerned about cutting through the graphics. After consulting with Jane, we decided to put the hole on the upper side of the instrument facing the person playing the uke. It worked out ok, but this isn’t the loudest one I’ve ever built by any stretch. Finished, it’s as cute as can be, I’m just hoping Thomas the Corgi approves.